As New York Comic Con approaches, Image Comics will be arriving on the scene in the New York Metropolitan area with plenty of exciting opportunities for fans to meet comic creators and get a glimpse at the Image Comics WHAT’S NEXT Chevy Sonic, which has been decorated with artwork from Image Comics' current hit series, LAZARUS, EAST OF WEST and new series VELVET and PRETTY DEADLY. Saturday, October 5th at 4 PM, the WHAT’S NEXT car will be visiting FOURTH WORLD COMICS, located at 33 Rt 111 in Smithtown, NY. FIVE GHOSTS Writer Frank Barbiere will be in attendance for a signing at the store, and fans will be able to get free items and see the WHAT’S NEXT car up close. Monday, October 7th at 7 PM, the scene shifts to Forbidden Planet in New York City, located at 832 Broadway. The Image Comics WHAT’S NEXT car will be parked right out front to welcome Greg Rucka, writer of LAZARUS, and Ales Kot, writer of ZERO, who will be joining Frank Barbiere of FIVE GHOSTS for a signing. Forbidden Planet will also host IMAGE COMICS NIGHT on Wednesday, October 9th at 7 PM, celebrating the launch of ROCKET GIRL with Amy Reeder & Brandon Montclare, and featuring a cavalcade of Image's superstar creators, including Nick Dragotta (EAST OF WEST), Ed Brisson & Johnnie Christmas (SHELTERED), Sina Grace (BURN THE ORPHANAGE), Michael Moreci (HOAX HUNTERS), and Duffy Boudreau (BLACKACRE). Image Comics fans in the New York metro area can keep an eye out for the WHAT’S NEXT car, as it will be making surprise stops around the city and Long Island. Be sure to follow Image Comics on Twitter (@imagecomics), Instagram (@imagecomics) and/or follow the hashtag #NYCCKOTR to see where the WHAT’S NEXT car will pop up next. The Image Comics WHAT’S NEXT car will be on display at New York Comic Con from October 10 through October 13th. 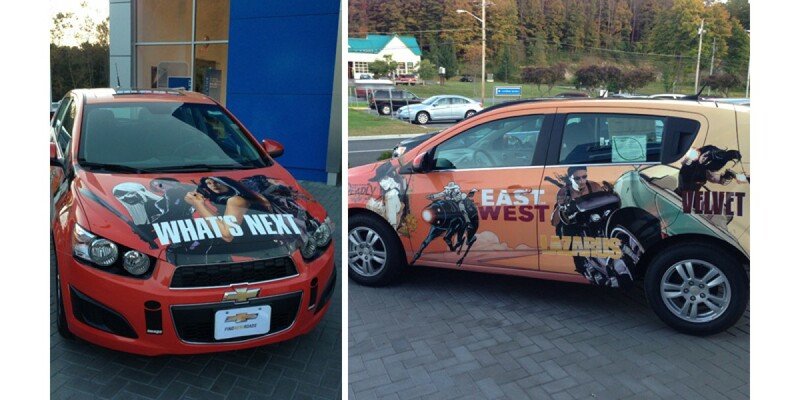 Fans can check out the art, take pictures with the car, and learn more about Image Comics and the Chevy Sonic.